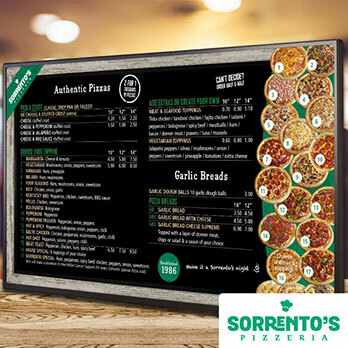 Using digital signage effectively provides a new, dynamic way for you to connect with customers and helps create a memorable dining experience. You can serve up high definition images of food on to strategically placed screens to attract customers, increase footfall, and influence buying decisions. Visually strong content engages customers. Combining this content with offers will see increased revenues on the promotions that you focus on. Digital signage in windows attract attention to your establishment over an above the traditional menu display. Window displays work well for promotions such as early bird menu’s or drinks offers, as well as showcasing the quality of your food with thoughtful photography and videos. Digital Messaging Company have been a pleasure to deal with. The screens were up and running prior to the launch date with all content managed quickly and efficiently. The screens and menu content look fantastic, adding to the look and feel of the new restaurant. 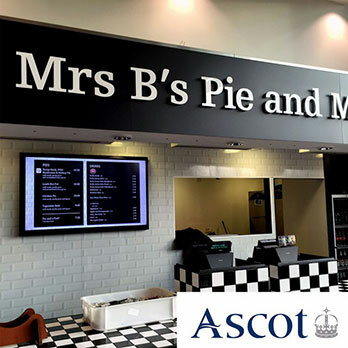 Chopstix Group UK are very pleased with the support and development provided by the Digital Messaging Company enhancing our customer’s experience with modern digital display menu boards and media. 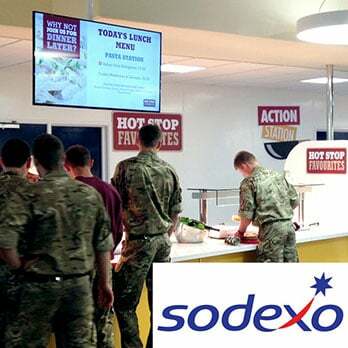 Working across, Defence, Healthcare, Education and Corporate sectors, Digital Messaging Company specializes in supporting FM giants to promote their retail offers using digital menu screens and strategically located promotional screens, all done in full collaboration with their client hosts, be it MoD, NHS, or private sector establishment.